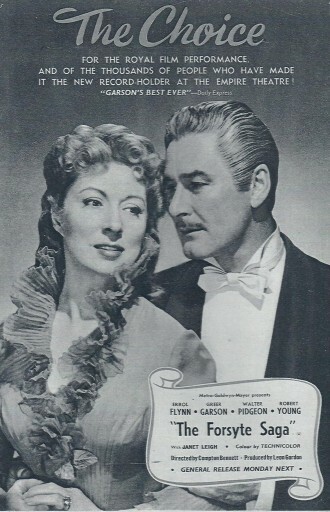 Errol Flynn was in fact, very good as Soames Forsyte in the Hollywood version of the Book that was adapted so successfully a few years late for BBC Television in Britain. This film went under the title of ‘That Forsyte Woman’ but I can’t think why – maybe they thought The Forsyte Saga would be a bit too formal for the viewing audiences back in 1949. It seems like a mistake to me. Irene was played in this film by Greer Garson. This film is beautifully photographed in Technicolor with lush costumes but it’s Errol Flynn who steals the show– without even trying.